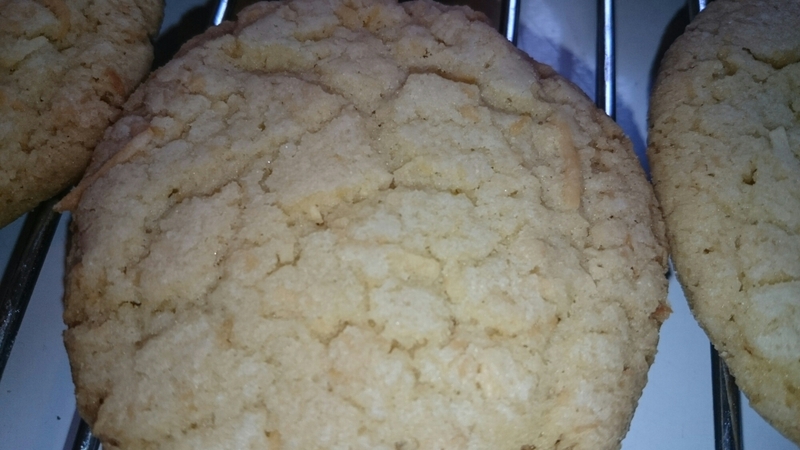 There is nothing like a good oatmeal cookie. The classic, old-fashioned taste in a perfectly modern setting. I am an oatmeal fan. Now, I don’t mean in the sense of eating oatmeal all the time for breakfast, but I love oatmeal in baking. It’s so versatile! Need a binder for a burger patty? Oatmeal! Need breakfast? Oatmeal! 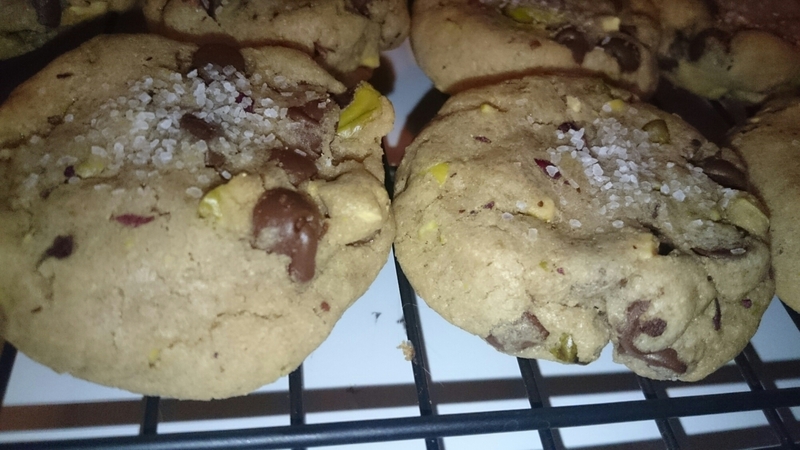 Need something else to add to your cookies? Oatmeal! You get the jist. Oatmeal is such an excellent complement to many flavours, but it really can stand up on its own, and I love that. These cookies are celebrating all things classic oatmeal. I found the original recipe here, and I love it! I mean, a good cookie is a good cookie, and sometimes, oats just need their time to shine as well as chocolate chips, am I right? Cream together the butter, sugar, and brown sugar. Add in the egg and vanilla, and combine well. In a separate bowl, whisk together the flour, cinnamon, baking soda, salt, baking powder, and nutmeg. Add to butter mixture, and mix until flour is combined. Fold in the oats until thoroughly incorporated. Using a teaspoon or small scoop, form dough balls and place them on the prepared baking sheet about 1-2 inches apart. Bake in the preheated oven for 10-12 minutes, until center looks just set. Cool on pan for 5 minutes before transferring to a wire rack to cool completely. Holy moly it’s been a month! I both can and can’t believe it. Life has been running away with me this past month, and I’ve barely had any time for any baking! In case you’ve forgotten, I was a bridesmaid in my friend Sandi’s wedding in Nelson in the middle of the month, and I’ve been working at the restaurant and planning for my new teaching job – yes, in case I forgot to tell all of you beautiful souls, I got a teaching job! All of that, combined with still trying to frantically finish our own wedding planning (and paying for all things wedding!) equals no time for me to make ANYTHING. However, I found myself with a rare day of peace today, and I was resolved to spend my day in the kitchen making some fabulous goodies. While I made a bunch of things (that will also be posted soon… now I have back-up material for the next few posts! ), these cookies seemed like the right choice to start us back off. I found the original recipe here, and if I make these again, I am definitely not going to bake them as long. 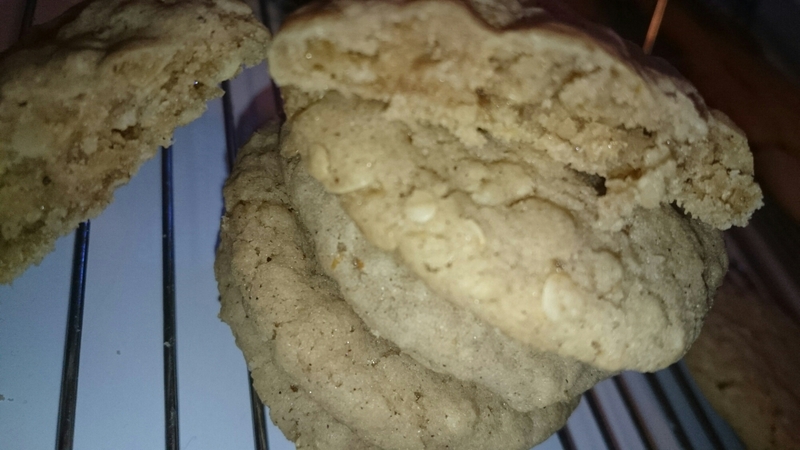 Mine came out more crunchy than chewy, and I am a big fan of a chewy, soft cookies. I have changed the baking time to reflect this. Cream together sugar, brown sugar, and butter until colour lightens. Add in egg and vanilla, and combine again. Mix in the coconut until well combined. In a separate bowl, combine the flour, baking soda, and salt. Add to the coconut mixture in three additions, mixing well after each addition until the flour is incorporated. Using a teaspoon or a scoop, drop rounds of cookie dough onto the prepared sheet pan. 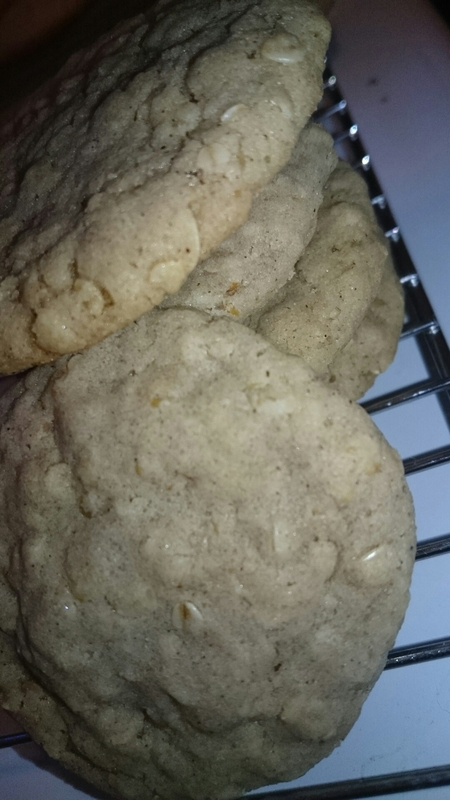 Bake in preheated oven for 15-17 minutes, until the edges of the cookies are just starting to turn a golden brown. These cookies combine three wonderful things all together in one place… I mean cookie. These goodies have been on my Pinterest board for a while, and as I was perusing through my pantry, I came upon a hidden trove of pistachios! It was meant to be. I love cookies. They are a simple, basic recipe for the most part. Cream butter and sugar. Mix dry ingredients separately. Marry them together, and voila! Cookies. Plus, they are portable, single-serving desserts. I may also use them as currency occasionally. You know, “Hey, can you feed my cats while I’m away? Yeah? Great, I’ll pay you in cookies and baking!” People love it. Preheat oven to 350°F. Line a sheet tray with parchment paper or Silpat, if desired. Cream together the butter, sugar, and brown sugar. Add the egg and vanilla and beat again. In a separate bowl, combine the flour, salt, baking powder, and baking soda and whisk to combine. Add dry ingredients to wet and mix until combined. Fold in the pistachios and chocolate until evenly incorporated. Using a spoon or scoop, form tablespoon-sized dough balls, and place 1-2 inches apart on baking trays. Flatten out slightly by pressing lightly on the dough. 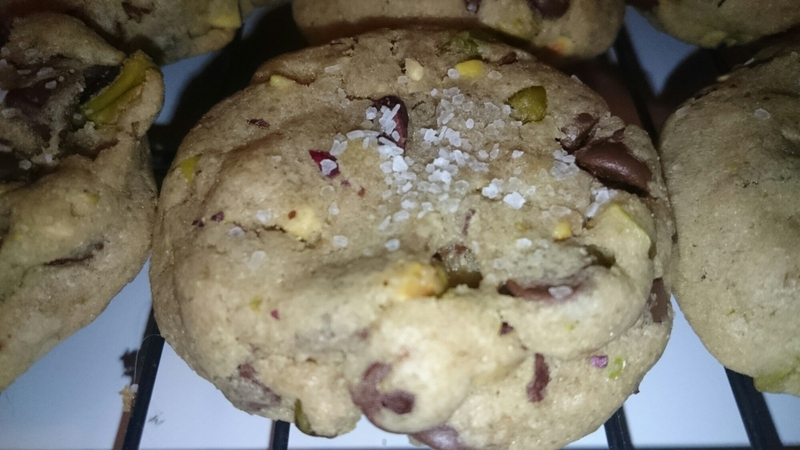 Sprinkle sea salt on cookies. Bake in the preheated oven for 12-14 minutes, or until light golden around the edges. 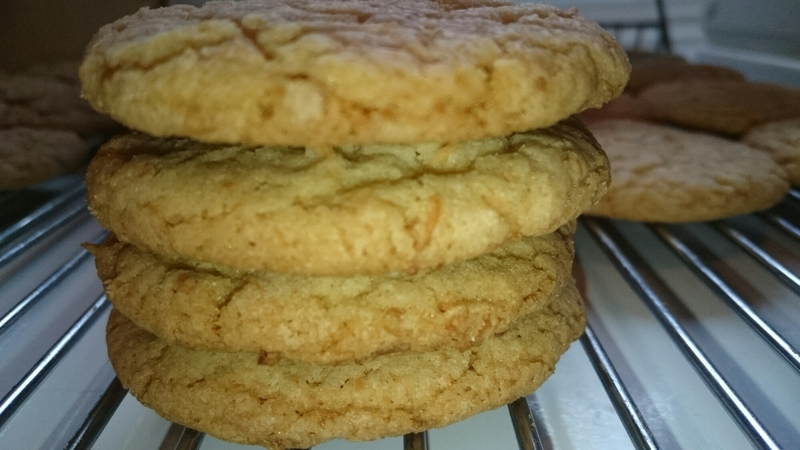 Let cookies sit on baking sheet for 2 minutes before transferring to wire rack to cool completely.